Here’s a great contest from my publisher Kaplan. Follow the directions for a chance to win big! Pin the graphic to the left to get started. 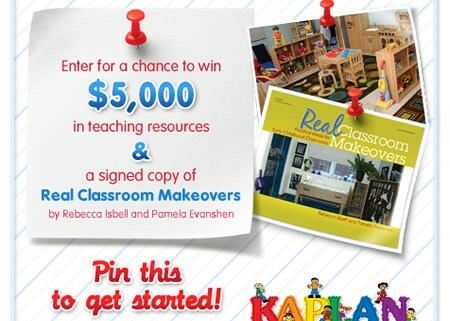 Include at least 5 products from www.kaplanco.com and at least 1 image of your dream classroom or classroom inspiration. Pin each item with the hashtag #PinIt2WinIt. “Like” us on Facebook & tell us why your classroom should be the winner! To be considered, all comments must contain a link to a Pinterest board as described in Step 1. Entrants must follow all instructions listed in Steps 1 and 2. • Boards must be created between 12:00 AM EST August 1, 2012 and 11:59 pm August 31, 2012. • Limit one entry per person regardless if entrant has more than one Pinterest account. • Winner will be announced September 3, 2012. A Small Classroom: No Place for a New Learning Center? The PreK conference in Alabama was fabulous. It was well organized, interesting, and filled with amazing early childhood professionals. The folks who attend my preconference session were so involved and a pleasure to talk with. One of the questions that came up during the training was, “How can new learning centers be included in my classroom when it is so small?” As I travel and present on environments that include learning centers, I frequently hear this concern. One of the best ways to add a new learning center in a “filled” classroom is to transform a traditional learning center. A Home Living Center can become a Restaurant for a short period of time, two to three weeks. When the children lose interest in the Restaurant, you can return the space to the traditional center of Home Living. The Block Center, a traditional and long-term center in many classrooms, can become a Garage Sale/Flea Market temporarily. The block area has many props that can be used to display the new items that are added for sale. Making these transitions and adding new interest centers will stimulate young children’s thinking, their socio-dramatic play, and their skills for cooperative work. Tell us about a transition that has worked in your classroom. What area did you add and what props were included in your new learning center? http://drisbell.com/wp-content/uploads/2012/05/DSC_2152-2.jpg 3008 2000 Dr. Rebecca Isbell http://drisbell.com/wp-content/uploads/2015/12/logo-splash-trans1.png Dr. Rebecca Isbell2012-05-14 13:21:412012-05-14 13:21:41A Small Classroom: No Place for a New Learning Center? Al PreK Conference – Dr. Isbell with teachers who attended her full day workshop on Designing Amazing Environments for Young Children. Classroom setup and structure are critical elements in teaching and controlling behavior and student interactions. What do you need to know? What are the best practices? How might rearranging your classroom help you? 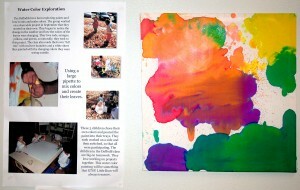 Today I am entering my first blog on the topic of creativity in young children. For many years I have read everything that has come out on the amazing abilities of young children. One of their most astounding skills is their creative thinking. E.P. Torrance concluded that we are most creative when we are “4 ” years old. This might be discouraging for some of us who are older than 4, but if we work with young children, we see examples of their creative abilities every day. The child who invents a new word, or a child painting with a feather, or a child composing and singing a new song are all examples of creative children in action. Today it seems that many people are more interested in the “right” answer, or doing things in a specific way rather than thinking in creative ways. But creative thinkers are needed to deal with our fast changing world, to create new inventions, and deal with issues never before encountered. We in early childhood must strive to build children’s confidence in their thinking and inspire their creative ideas. How do we spark creativity in our classrooms? There are so many different ways that we can impact the development of creativity. One powerful way is by provding children choices throughout the day – which Center to work in, the materials to use in a collage, or the way to dramatize a story. The environment can also impact creativity by including beautiful displays, unique treasures to explore, and a place to keep special projects to revisit. It is interesting to note that creative teachers have the most creative children in their classroom—-not a surprise is it? Let me know something you have done in your early childhood classroom to encourage your budding artists and creative thinkers. Everyday dedicated teachers are doing wonderful things that nurture creativity in their classsroom. Let’s start celebrating these ideas!